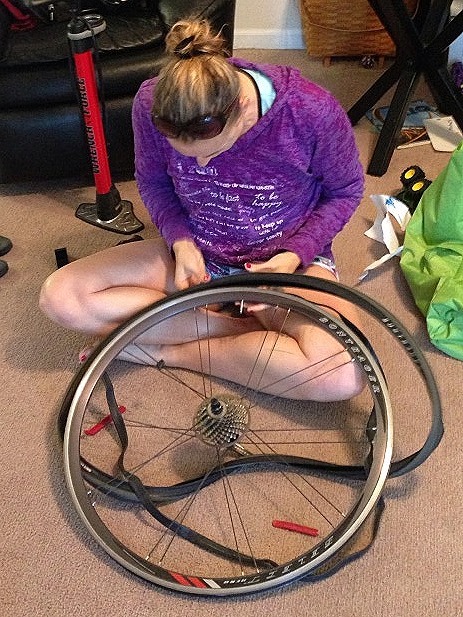 I know that most of us ladies would prefer to keep from getting dirty and changing our own bike tires but reality is that when we are out on the road and we flat, there aren’t many options. So learn to fix a flat or be prepared to always call for help. Although there is nothing wrong with calling for help the first time, it gets kinda lame if you need to do it continuously. 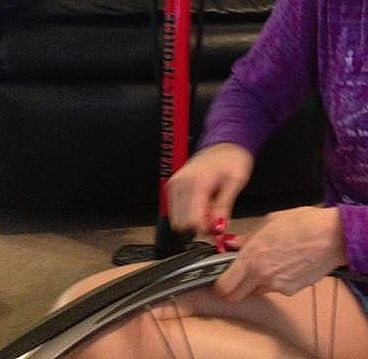 So you need to learn to fix your own flat. I got a flat last week on my trainer. I don’t know how. I don’t know why. I tried to just “pump and ride” but it still went back flat within a short amount of time. So last night after my craptastic swim, I decided to do something productive and change my tube. Aby was delighted to keep her hands clean photograph the process for us. Tools – 2 Levers that will be found with your tire changing kit, cuz I know you have one on your bike. Now go find it. And you’ll need a new tube and an air pump (CO2 cartridge if your on the road). The easiest way to get a tire off your bike is to invert the bike. Handlebars down. Tires up. Release the brakes. Release the tire lever. If it’s the back tire, cuz it will be since that’s the hardest one, then gently pull the tire off while pulling the chain wheel cassette back to release the chain. Yes, you’re going to get dirty. Do it anyhow. 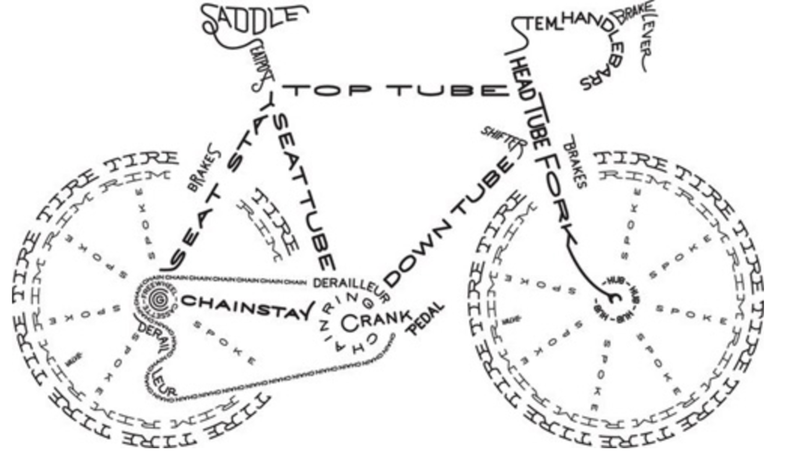 Before you get all freaked out on bike terminology, check out this diagram below from Gear Junkie. It will tell you more than most of what you need to know. 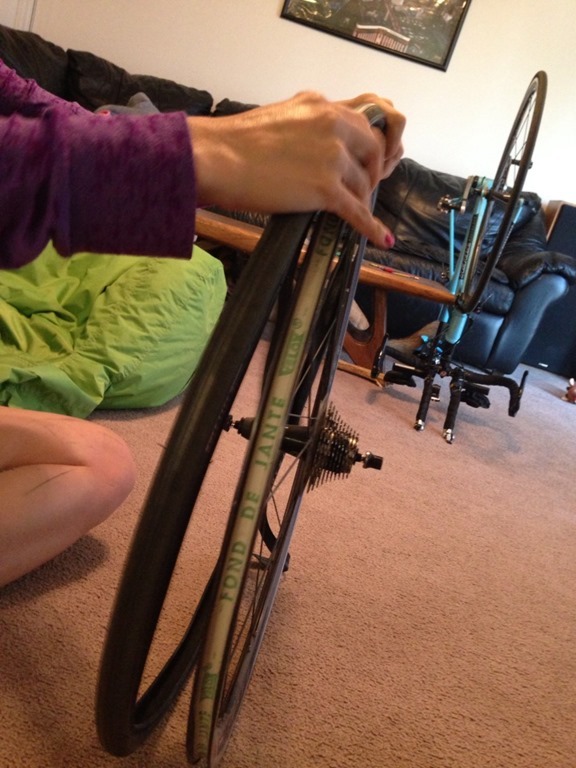 After the tire is free, then gently lay your bike flat unless it seems steady in the inverted position. Grab the tire levers and just sit down if possible. This is going to take a minute if it’s your first or second or third time. Put one tire lever between the rim and the tire and start running the lever around the rim separating them. I normally leave one lever in and then start prying the tire from the rim with the second lever. You’ll need to be determined and run that lever around the outside of the rim and break the tire free. Once the tire is free, then you can grab the tube and remove the stem valve (where air goes into the tire) from the rim. Throw the old tube to the side, grab the new one and remove the end cap and washer from the stem of the new tube. Once you have the new tube uncapped, you are ready for the real fun. Slightly inflate the tube, just enough to give it a little shape. 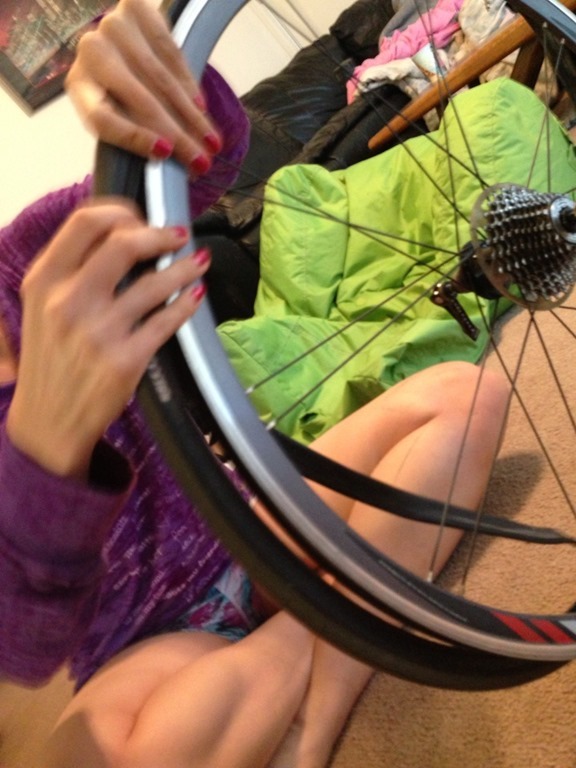 Then insert the stem valve of the new tube thru the stem hole in the rim. Grab the tire. Start the tedious work of putting the puzzle tire back together. Sitting the tube on the rim in the groove, then putting the tire on top, maneuvering both sides of the tires inside the rim with the tube in the middle space. And work your way around the tire, little by little. It’s slow going. At the very end, you’ll need to use the tire lever to get the last of the tire onto the rim. When the tire is fully reseated, don’t get too excited and just go blowing it up. You need to check your work and make sure the tube is not pinched somewhere between the tire and the rim or it will flat as soon as you start the inflation process. This is what real cyclists call a “snake bite”, because the new hole in the just installed tube will have 2 tiny side by side holes which will look like a snake sunk it’s fangs into the tube. Not cool. Not worth trying to hurry! So rotate your tire to where the stem valve is located. Start rotating the tire and pushing the edge of the tire back to make sure that the tube is not caught anywhere between the rim and the tire. Do this on each side of the rim/tire. It’s important. Always start at the valve so that you know when you’ve made a full rotation. Then if all is well, start inflating the tube. Slowly. You may need to reseat the tire in some spots if it’s bulging anywhere or you notice any problems. Go slow. Then reinstall the tire on the bike. 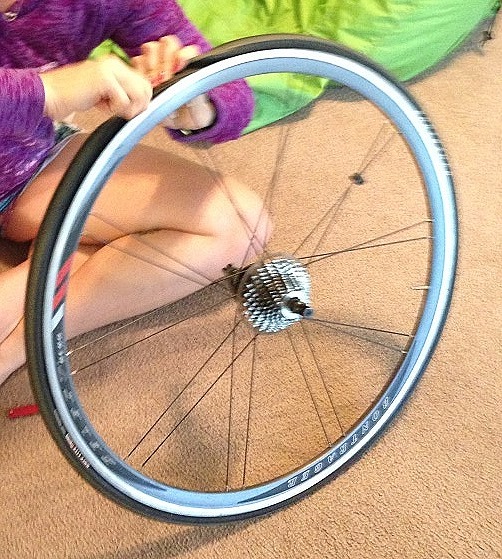 The hardest part of the reinstall is dealing with the chain wheel cassette (back wheel only). You have to touch the chain and gently pull it up and out of the way to get the tire back in the proper position. Then don’t just drop the chain wherever but place it back on the cassette in good spot so that you don’t totally jack up the gears and have another problem on your hands. After the chain is back on the cassette, the tire is in location, tighten the tire lever and don’t forget to flip the brake lever back into position too! 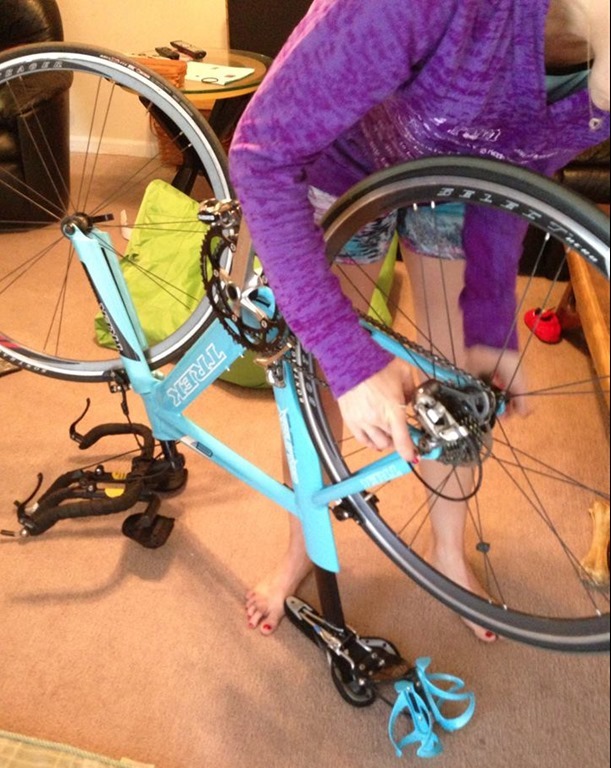 Then spin the pedals a few times by hand to tighten up the gears, and make sure that everything is back where it should be prior to turning the bike upright. If all looks and feels right, away you go but don’t forget to grab your garbage if you are roadside! 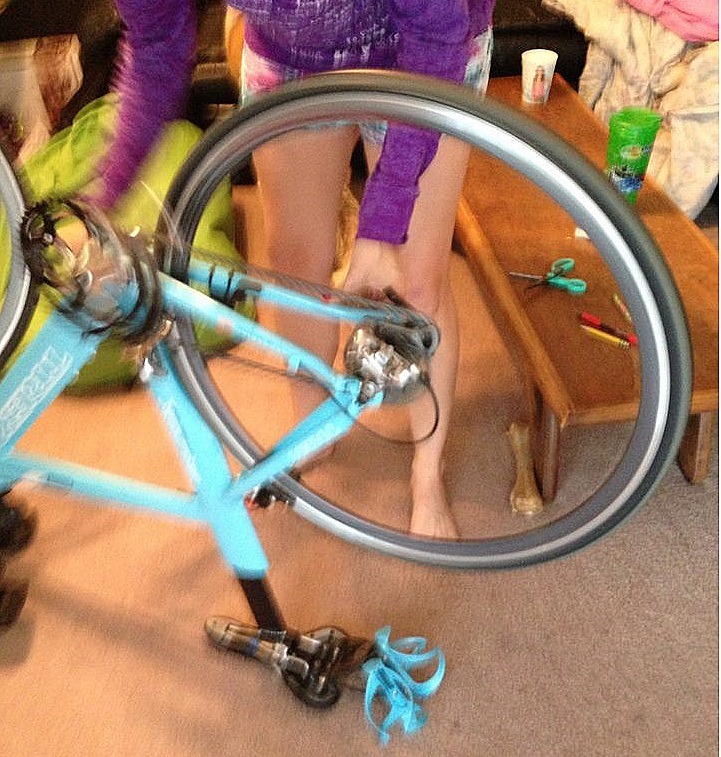 If you are at home, please take the bike for a spin to make sure everything is in the right spot before you go out to hammer your next long ride! If you are looking for a more professional, detailed, step by step approach, please feel free to check out a video HERE or go to your local bike shop for an in-house demo. 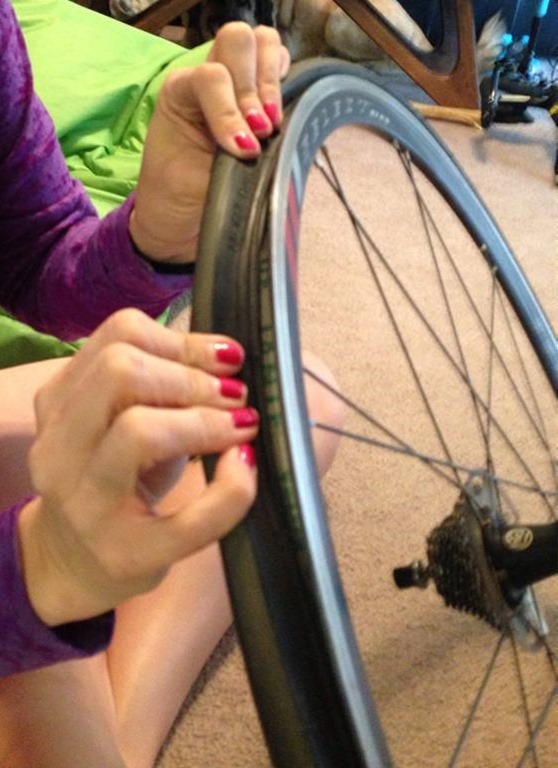 Fixing a flat is not hard, just time consuming for most of us and messy. But you can totally do this. Practice in your living room so that you’ll be ready if you need a roadside repair. 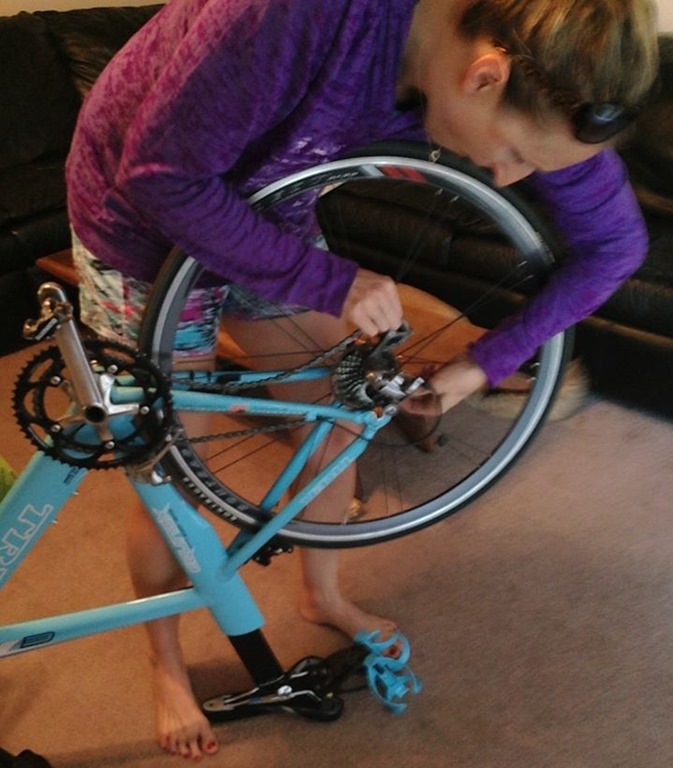 This entry was posted in Cross Training, Cycling, Triathlon and tagged Fix a flat tire on your bike, flat tire instructions & photos, How to Fix a Flat, ladies can fix flat tires too, step by step instruction on how to fix your own flat by tootallfritz. Bookmark the permalink. Good description with pics going through the process. 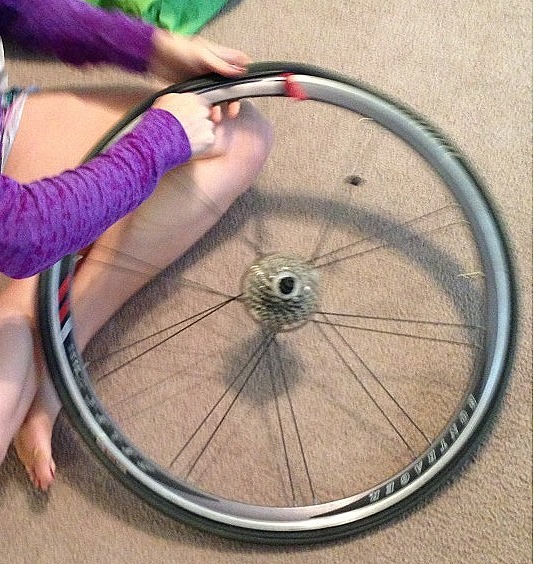 Another thing…you don’t always have to replace a flat tire with a brand new tube. 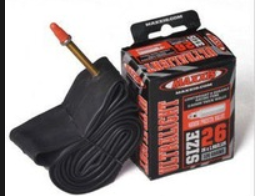 If the flat was from a simple, small puncture you can patch it using tube patch kit. Finding the hole can be as simple as partially inflating the old tube and applying some water or better yet dip it in bucket of water section by section and look for air bubbles and mark the spot with chalk or white-colored crayon. You could do a separate post on that – patching a tube! This is a GREAT post Amanda! I am going to save it because I’ll probably need it one day and wish I had it! !